Before giving you the reasons to visit Naran Kaghan valley, we will be telling you a little about Naran Kaghan tour. Also, we shall share some of the beautiful places to visit in Naran Kaghan in Naran Kaghan tour 2019. Naran and Kaghan are basically two different towns in Mansehra District of Khyber Pakhtunkhwa province in Pakistan. Naran valley is the most touristic site in Pakistan, hosting around millions of tourists annually. Most of them are Naran Kaghan tour packages from Rawalpindi. While Kaghan is the major valley in which Naran is a town at the distance of 65 Kilometers. Naran Kaghan road condition is very good compared to the Karakorum highway. As in summertime, most tourists use this road to reach Gilgit-Baltistan region in further northern Pakistan. Naran Kaghan weather is mostly cold all the times as Naran only opens in summers for tourists. While Naran is closed in winters time because of heavy snowfall that blocks everything in the region. 4 days trip to Naran Kaghan is recommended by us if you just want to explore Naran Kaghan valley. 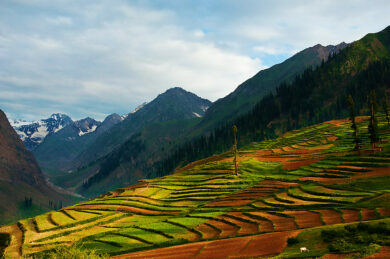 As 4 days are enough to cover up most of the attractions in Naran valley. Lake Saif-ul-Malook is the major attraction in Naran Valley. As this Lake is easily accessible by jeep ride from Naran Market. It takes almost 45 minutes to reach the lake from Naran Kaghan Hotels. This lake can make one go mesmerized with its beauty surrounded by meadows and mountains. Malika Parbat is on the back of Saif-ul-Malook with the elevation of 5290 meters. It can be seen easily from the lake, also trek for Malika Parbat peak starts from the lake. 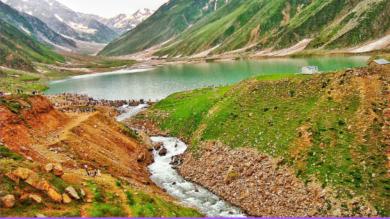 This lake can make your Naran Kaghan tour unforgettable. As this lake in Naran Kaghan Valley has a fairytale on the name. Saif-ul-Malook was a name of fairytale written by Sufi Poet Mian Mohammad Bakhsh. The story is about the love story of Persian prince Saif Ul Malook and Fairy princess Badi-ul-Jammal. This lake is the elevation of around 3200 meters. This attraction is on the list of best places to visit in Naran Kaghan. While moving further to the heights, there’s a point with the name on Board Lulusar Lake. That is the place to stop by and take some beautiful pictures. This is the biggest lake in Naran Kaghan valley as it is the main water source of River Kunhar in Naran with an elevation of 3400m. 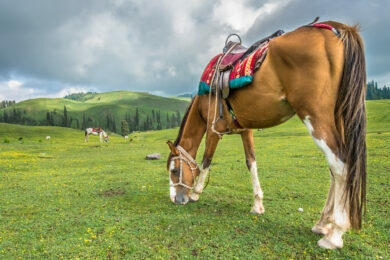 Having Naran Kaghan Tour 2019, this should be your must-visit destination in the plan. This lake is situated Lulusar-Dudipatsar National Park of Naran Kaghan Valley. The lake is only accessible by trekking to the elevation of 3800 meters. The trek starts from Besal near Jalkhad of Naran. 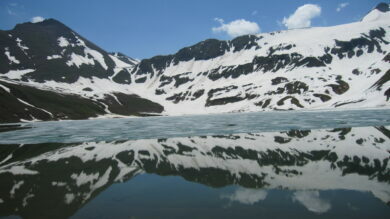 Because of Snow covered peaks around the lake, the name was given to the lake as Dudipatsar. As Dudipatsar means White Mountains Lake. 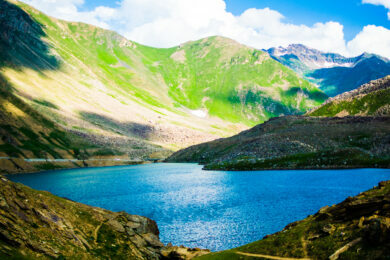 This lake is also described as Queen of the Lakes, making it one of the best places to visit in Naran Kaghan. Only go for it on the trek if Naran Kaghan weather is clear. These meadows are located in Shogran Valley of Naran Kaghan. Siri Paye meadows are actually two locations, Siri and Paye. Siri is a lake that comes before the Siri Paye meadows. It’s a curvy jeep track in a dense pine forest with the altitude of 3048 meters. One should visit this place if deciding to have Naran Kaghan Tour packages from Rawalpindi. If one is deciding to have a Naran Kaghan tour 2019, he should try to visit Lalazar. As it is a plateau with the deep pine forest on the surroundings. Starting from Batakund of Naran Kaghan Valley, this place is accessible by a muddy jeep track only. Situated at an elevation of 3200 meters, this place is famous for the wildflowers and the views around during the summer time. This lake is one of the best places to visit in Naran Kaghan in Naran Kaghan Tour 2019 for the ones who love to do the trekking. 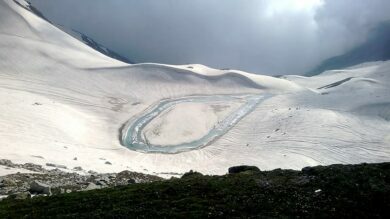 Ansoo Lake is the word for Naran Kaghan tour guide in Urdu, which means “Tear”. Situated at the altitude of 5027 meters in the Himalayan Range, the lake provides some of the mesmerizing views in Naran Kaghan valley. It takes almost 8-9 hours for a round trip trek starting from the marvelous Lake Saif-Ul-Malook. 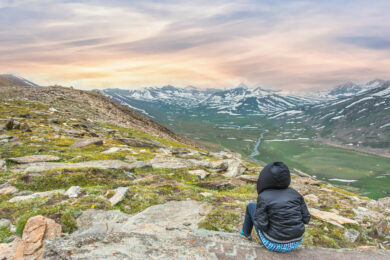 If someone is looking for an adventure in Naran Kaghan Tour 2019, he should visit Babusar Top in Naran Kaghan Valley. Babusar top is the last point of Naran Kaghan region with the highest elevation of 4173 meters (13,691 ft). In an actual way, this is the pass that connects Gilgit-Baltistan with Khyber Pakhtunkhwa province of Pakistan using Naran Kaghan valley. The weather condition is mostly bad at the top, as it changes every time from sunshine to snowfall and cloudy. One should have this point in best places to visit in Naran Kaghan Valley. As we shared some of the best places to visit in Naran Kaghan valley in Naran Kaghan tour 2019. These attractions can be used as you mesmerizing reasons that why should you visit Naran Kaghan. Also, there are a lot of other reasons like Naran Kaghan valley is the most famous destination in tourists of Pakistan. Because most of the people just go for the vacations to Naran Kaghan Valley far from their home cities to enjoy the best weather as Naran Kaghan weather always remains cold. Mostly Pakistani people like to visit on Naran Kaghan tour during the summer times, when the temperature in the cities rises. Some of more reasons for me is like most of the Pakistani tourists visit Naran Kaghan Valley, as it is easily accessible. Naran Kaghan road condition is really good and it takes around 8 hours if one has Naran kaghan tour packages from Rawalpindi. Also, the main reason to visit this mesmerizing Naran kaghan Valley is if you want to see some of the high mountains and dark pine forest along the beautiful River Kunhar. Because Naran Kaghan is at the elevation of 2409 meters. Along with these reasons, Naran Kaghan tour 2019 is the most modern travel destination in Pakistan with a lot of best Naran Kaghan Hotels and restaurants. The reason that you must have to visit such places is your heart wants to visit that places, that you want to see such Naran Kaghan valley. You want to see some of the 4000 and 5000 meters high mountains with beautiful meadows and blue lakes. There is the most important reason that can make your mind to have Naran Kaghan Tour 2019, as Naran kaghan Valley is the best place to visit in northern Pakistan with such cheap Naran Kaghan Tour packages 2019 as compared to other destinations. As we described a lot of mesmerizing reasons for why should visit Naran Kaghan. Still, have a lot of things to share with you guys as Naran Kaghan Valley is huge to travel, but normally it just required 4 days trip to Naran Kaghan to explore such beautiful Locations.